Chris Ryan: I guess if someone is going to take the spotlight from the just-named MVP, it might as well be the guy with plantar fasciitis and two newly inserted plates in his face. Mike Conley Jr. returned to the playoffs in Oakland last night. Steph Curry already has the trophy, but Conley had his special cup, and he was the most valuable player on the Oracle floor, scoring 22 points in 27 minutes. For as impressive as his hot start to the game was (he had nine first-quarter points), and for as important as his dagger-dealing finish proved to be (see the Vine above), the best thing Conley did last night was to get back up. This moment happened with five minutes left in the second quarter. It was coming. At some point, someone was going to see just how super the man of steel was. Surprise: It was Draymond Green. Conley stayed in the game. There might as well have been a flashing sign above him reading “USEFUL METAPHOR.” The Grizz handed one of the best teams in regular-season history a loss on its home court. It’s the first time the Dubs were on the wrong end of a home game since January. Just like their point guard, the Grizz are back. Jason Concepcion: Tony Allen is a career eight-point-per-game scorer. He is a shooting guard who struggles with shooting. He averaged the same number of turnovers (1.4) as assists this season. He is a player renowned for erratic offense, including his propensity to badly blow open layups. That said, Allen does have an elite skill: More than anything, he really hates seeing dudes eat. In the regular season, players who had the misfortune to be guarded by Allen saw their field goal percentages drop by an average of 6.9 percentage points. That’s the best mark in the league, per NBA.com, for players with 60 or more games. In the playoffs, Allen’s dungeon has become even darker, more bleak, more torturous, and more inescapable — his opponents are shooting 10.9 percentage points worse than average. Be you man, woman, child, or beast, Allen lives to throw grime on your shine. He is a professional hater. That’s why he’s #FirstTeamAllDefense. Tony Allen gives your routine zero out of zero fucks. Now dap him. Klay Thompson is coming off a season in which he averaged career highs in points per game (22), field goal percentage (46.3), 3-point percentage (43.9), free throw attempts (3.3), free throw percentage (87.9), assists (2.9), and steals (1.1). In the first round, he seared the Pelicans over a charcoal flame to the tune of 25 points per game on 49 percent shooting. In Game 2, Allen was the hellhound forcing Thompson into a five-turnover waking nightmare, punctuated by Allen pouncing on Thompson like a leopard setting upon an injured herd animal at a watering hole. Andrew Sharp: What did we just watch? How was it that close? Does that really count as a playoff game? How did I get to a place in life where my serenity depends on Ramon Sessions isos and Garrett Temple step-back jumpers? Is this a scene-for-scene remake of last season? Maybe. The Hawks are doing a great impression of last season’s Pacers. The Wizards beat a horrible team in Round 1, then stole the first game of Round 2 and got everyone excited. Now? Just saying: The worst-case scenario is on the table. Everyone proceed with caution. But what if Paul Pierce is enough to change everything that doomed them last year? He really might be. What if Otto Porter is a ray of light sent from the heavens to usher the Wizards out of the darkness? He really might be. Remember when Pero Antic was dueling with Drew Gooden in the 2015 NBA playoffs? And Sessions was dominating for the entire third quarter? It was a hell of a night out there. How long will Randy Wittman continue to play Nene and Marcin Gortat together? Will it be long enough to cost them the series? Isn’t it scary that the Wizards spot the Hawks 10 points in every first quarter? Wouldn’t it be amazing if they won anyway? There is something special happening in Washington. That’s all I know. I think. All hail Playoff Wittman. Who must we sacrifice to make sure Wall gets healthy? The Hawks are a mess. It’s time to pounce. If Kevin Seraphin has to go, so be it. Was that an internal victory? Ready for Game 3? Well, we have to wait till Saturday for some reason. Plenty of time to try to make sense of two games that made no sense. Did that qualify as The Ramon Sessions Game? YES. Ben Detrick: For playoff opponents aiming to topple the top-seeded Hawks, the most urgent concern is preventing Kyle Korver from raining fiery death from the heavens. After a regular season in which he posted the fourth-best True Shooting Percentage in the history of the NBA, the sheer panic he inspires when curling off high screens or darting into baseline corners is a necessary survival instinct. But during the playoffs, hyper-focused attention and choreographed switches have proved effective at stifling Korver and, in turn, slowing the Hawks’ perpetual-motion offense. In Atlanta’s three losses (two against Brooklyn, one against Washington), Korver has been smothered by heliotropic defenses, leading to some uncustomary inaccuracy. He has gone 12-for-39 from the floor, 7-for-29 from 3-point range, and averaged 10.3 points in those games. For most of last night’s outing, Korver was again a finely coiffed bellwether. Cloaked by Paul Pierce and Bradley Beal, he was pedestrian from deep (4-of-11), and Atlanta found it impossible to shake the undermanned Wizards. But the Hawks have other shooters, and timely 3-balls from less-threatening sources like Pero Antic and Kent Bazemore eventually opened up late breathing room. 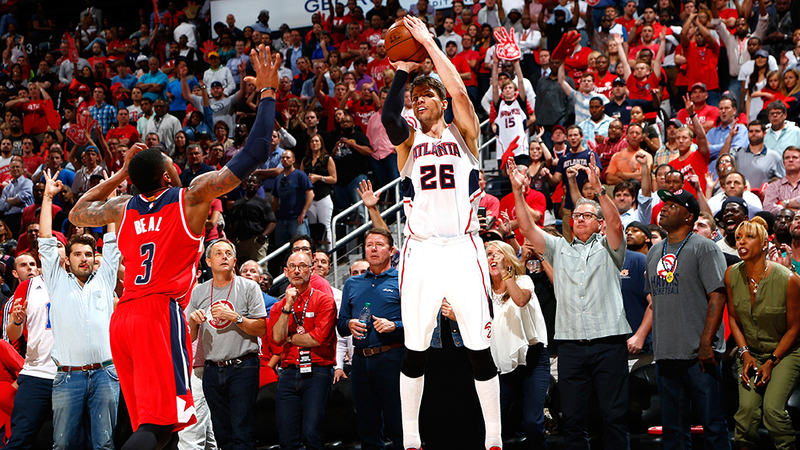 With less than three minutes remaining, Korver finally deposited a dagger that pushed Atlanta to a 10-point lead it would never relinquish. Still, following a challenging win on a night when John Wall was sidelined, it appears that an Achilles’ heel has been revealed: With Korver kept in check, Atlanta’s fearsome offense is far less toothy.